The Estronex Profile is a non-invasive test used to assess Estrogen metabolism. The test measures the ratios of estrogen metabolites through the urine to assess an individual's risk for estrogen based cancers including breast, uterine, cervical, ovarian and vaginal cancer. Imbalanced estrogen metabolism is also associated with Polycystic Ovarian Syndrome, Uterine Fibroids, Endometriosis, Preeclampsia, Osteoporosis, Menstrual abnormalities and Premenstrual Syndrome. Estrogen metabolism also affects men. The Estronex Profile can help assess risk for prostate and male breast cancers. Studies have shown that individuals with a low 2/16 Hydroxestrogen Ratio have an increased risk of breast and other estrogen based cancers. Elevated 4-Hydroxyestrone and Methylation Ratios are also associated with increased risk. 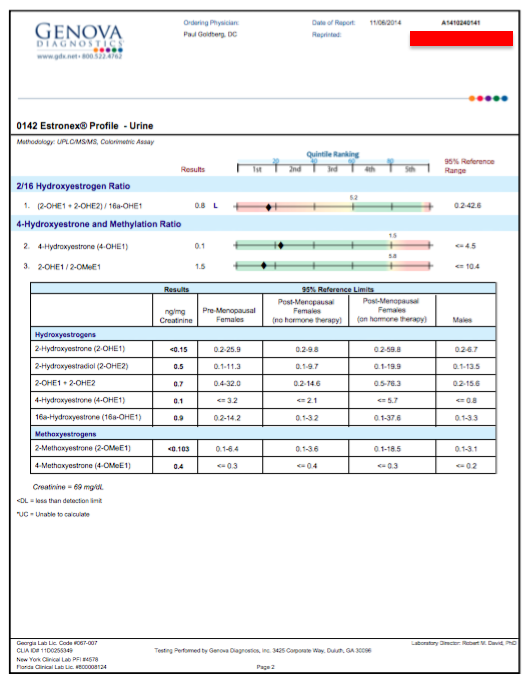 The following are before/after Estronex test results from patients at the Goldberg Clinic. The improvements seen came by addressing causal factors and without the use of drugs, herbs or other treatments/therapies. (Patient name and date of birth have been removed for privacy purposes).